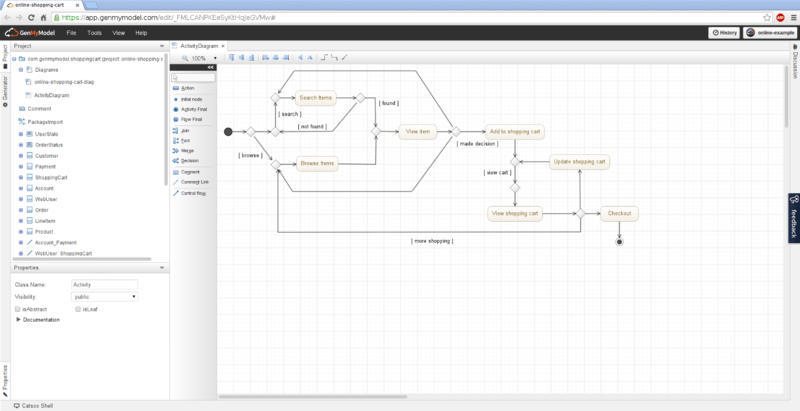 Create activity diagrams in seconds with GenMyModel, a free uml online tool to draw UML diagrams. GenMyModel is a collaborative UML editor with powerful features for creating UML activity diagrams, in the web browser. The activity diagrams are designed in seconds with the intuitive GUI. You create activity diagrams right away, there's no install, no setup and no learning curve to get started. 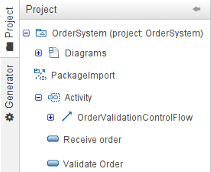 You can share and edit your UML diagrams in real-time. Actions, decisions nodes, merge nodes, control flows are created within a click from a user-friendly toolbar and shortcuts. At anytime, GenMyModel guides you through the design of a valid UML activity diagram by highlighting the UML elements that match an UML-compliant architecture. It saves time when creating UML elements such as merge nodes or decision nodes. The Activity diagram in the Unified Modeling Language UML is a graphical representations of workflows of stepwise activities. They are intended to model both computational and organizational processes. An activity diagram show the overall flow of control and the following model elements are typically involved in an UML activity diagram: activity, partition, action, object, control, activity edge. Create activity diagrams online, directly from your web-browser. It's not just drawing because the activity diagrams designed within GenMyModel conform the UML2 standard (UML activity metamodel). You get both a visual representation, called the diagram, and the internal structure of your model in a tree-based representation. It works on Windows, Mac, Linux and the supported browsers are IE, Chrome, Firefox, Safari and Opera. GenMyModel comes with many free examples, clonable within a click. You can access these professionally designed templates from the dashboard area. Click the button below to fork the Online Shopping Cart - Activity Diagram Example (free). Browse the activity diagram from the project explorer.